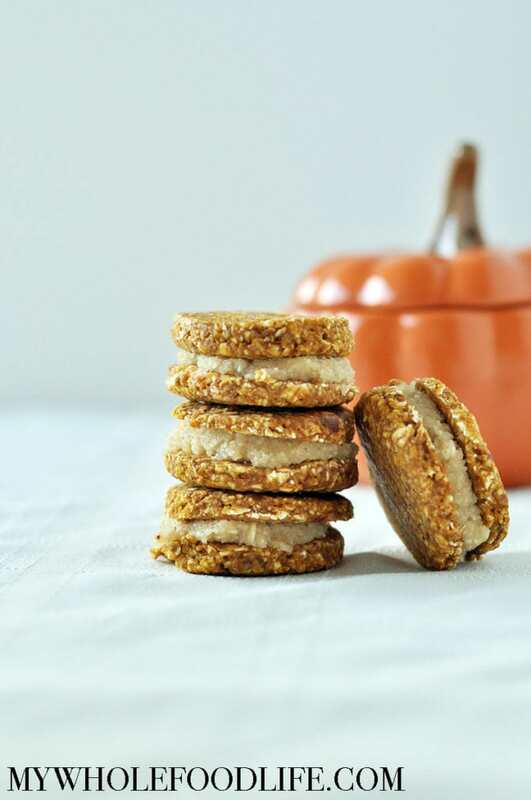 The perfect sandwich cookie for Fall! Drain the cashews and add them to a food processor with the maple syrup. Blend until smooth. Transfer to a bowl and set aside. In a food processor , add the remaining ingredients and blend into a dough. Gather the dough up, wrap in plastic, and place in the fridge for 10 minutes. I soaked and drained my cashews but now have to run out and won't get to finish making these until later today...any idea how long I can store these cashews in the fridge for? I also read somewhere that you can store them in the freezer (after soaked/drained) . Have you tried this? That would sure save time and allow me to always have these on hand! So often I'll want to make cashew cream but will have forgotten to soak my cashews. If you store them longer than 24 hours, change out the water. I have never tried freezing them, so I am not sure about that. If you ever forget to soak, you can always boil them for about 20 minutes to get the same effect. Is there a good substitute for the cashews in this recipe? My son can't eat nuts and I'd like to make these for all of us.